.:. Hiking in Big Sur - Mill Creek Trail .:. Note: this Mill Creek Trail is not to be confused with another trail by the same name at the northern edge of Big Sur. This is one of those trails that is off the beaten path just enough to keep the traffic down, yet still qualifies as one of Big Sur's great hikes. Mill Creek Trail is also almost all in the shade, under giant redwood, sycamore and maple trees, so is a marvelous hike for summer. After you park, walk back down the road just a few yards to the apex of the turn, and facing east, look for the discrete trailhead on your left. It goes straight up into the brush and continues east as an exposed and somewhat overgrown uphill path high above Mill Creek. You'll quickly head into the fragrant California Bay trees, and then catch glimpses of the rushing creek below on your right. Soon, the trail and the water join up, and you'll be following Mill Creek upstream the rest of the way, crossing it several times before the end. Mill Creek was named for a sawmill that at one time produced railroad ties at a site along the creek near the ocean. Before the highway was built, the trail was one of the more popular routes from the ocean to Jolon through the Santa Lucia Range, and is probably the same route once known as the Nacimiento Trail. Where a small stream (Lion Creek) branches to the left, veer right across the water and pick up the trail on the other side (you'll still be on the left/north side of Mill Creek). Though it is generally straight all the way up the canyon, the Mill Creek trail scatters here and there, and don't be surprised if you need to backtrack a bit to find it again. There are some fallen trees across the path, and hikers have created routes around the larger ones. Just keep an eye on the creek and you'll be heading in the right direction. The path is well trod and clear most of the way, but there are stretches that need some work and barely cling to crumbling walls along the creek. Eventually, you'll end up at a small campsite, with a stone fire pit set among the huge redwoods. The trail peters out at this point, and you can poke around the area a bit before heading back. Mill Creek Trail is one of the spookier hikes in Big Sur since you are threading a deeply wooded and rocky canyon with little open sky. You'll also notice that many of the huge redwoods have been cut down years ago, with their stumps remaining as silent testament to their grandeur. After the hike, consider driving up Nacimiento-Fergusson Road as it twists to the top of the Santa Lucia Range. There are sweeping views of the coast and spots to pull off and ponder the panorama from north to south. A couple miles up the road from the trailhead, there are several pullouts that overlook Mill Creek Canyon and offer a bird's eye view of where you were just hiking. N-F Road eventually crosses the top of the mountains and heads into Hunter Liggett Military Reservation and then on to Jolon or Lockwood Road and Highway 101. 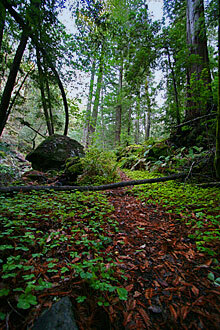 This trail starts from Nacimiento-Fergusson Road, which turns off Highway 1 at 8.5 miles north of Gorda, or 17.2 miles south of Julia Pfeiffer Burns State Park Entrance. The road is well marked and is just .1 mile south of Kirk Creek campground. There is a cattle guard at the start of the road, but it is otherwise well-paved up to the trailhead. This road is subject to closure further up at times, but access to the trailhead is rarely impeded. Mill Creek Trail starts at just about .8 mile up Nacimiento-Fergusson Road from Highway 1. You'll go around a major hairpin turn and then immediately see a large graded parking area on the left. There are also a couple parking spots on the right at the apex of the turn.